Riverbed Cascade is a new type of tool that incorporates traffic monitoring, packet capture and protocol analysis to provide an application-aware view of the network. Now you can see the path of applications as they traverse the network, and get a user's eye view of availability and performance. Mapping the application path through the network and measuring performance along the way helps you solve current problems, analyze trends and plan future network or application changes. 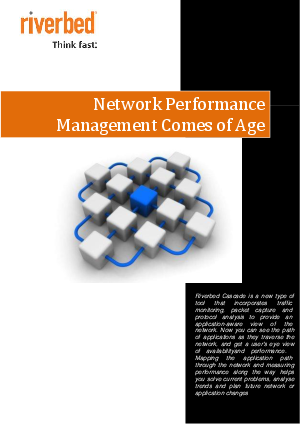 Download this white paper from NetMedia to learn how Riverbed Cascade can help to solve your IT performance challenges.